The Yugao Chapter from 'The Tale of Genji' - This incredible ghost image is one of the great masterpieces of Yoshitoshi's career and a series favorite. 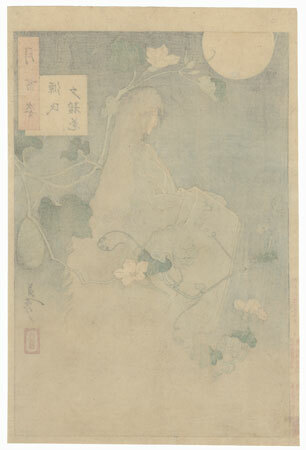 The print depicts the ghost of one of Genji's most mysterious and alluring loves- a woman he called Yugao (after the flowers) as she wouldn't tell him her name. The jealous spirit of one of Genji's former mistresses killed her. 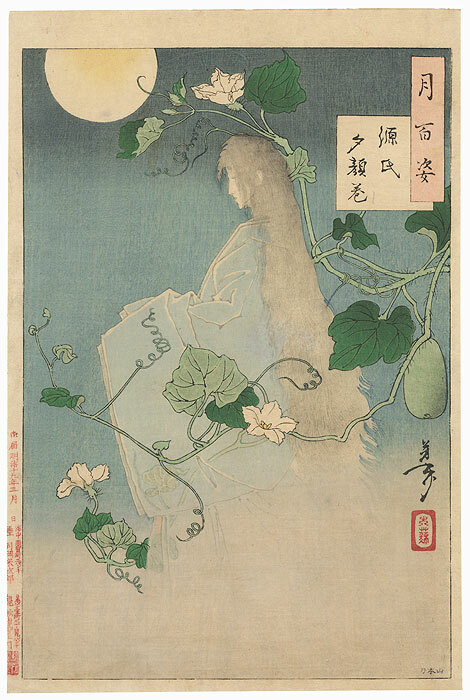 Here she floats through the image, a classic ghost depiction, and a flowering vine wraps around the figure and twists through the print. The full moon shines overhead. Yoshitoshi's design is captivating. From the ghostly figure in muted tones to the twisting blooming vines, the print draws the viewer in. A fantastic opportunity to collect one of Yoshitoshi's true masterworks. 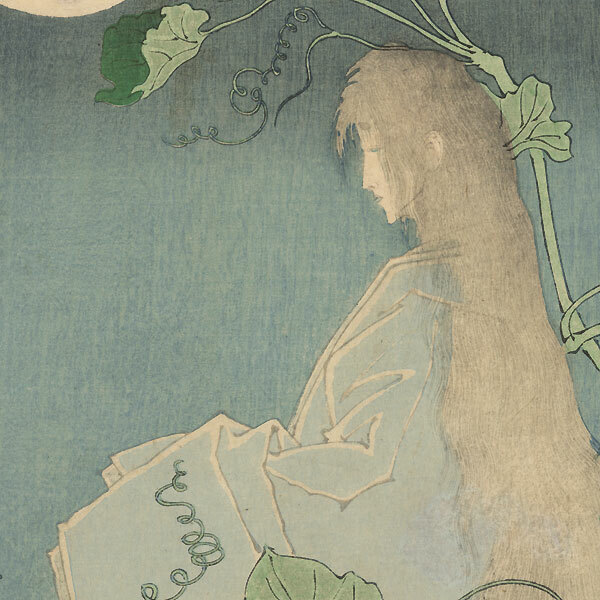 This beautiful ghost print from the 100 Moon series is an outstanding Yoshitoshi design. It was the cover illustration for the Stevenson book on the 100 Moon series. Without question, this is one the greatest Japanese print images of all time. Condition - With excellent color and detail. Some light toning. Please see photos for details. Excellent overall.